Simon is best known for his comedies, such as “The Odd Couple.” This time around, his approach is more serious, albeit with comedic highlights that keep the audience completely involved. Setting is Yonkers, New York, in 1941, in the home above the family business where Grandma lives with her daughter, Bella. It might be difficult to find a more dysfunctional family. The matron of the crew is Grandma who was born in Germany, and has survived terrible situations. She has become an embittered old woman — highly disliked by her family and with no local friends. The naturally warm and loving Wendy Moore has put on a gray wig and a harsh demeanor to bring Grandma to life as the unhappy woman. Grandma has two adult sons – Eddie and Louie, with whom she has had minimal contact in recent years. The brothers are both played by John Jankow, excellent in the roles. Eddie’s wife has died, and has substantial financial problems. He brings his two sons, ages 13 and 15, to Grandma’s house, asking his stern mother if she will let them live with her for several months while he travels cross-county to sell scrap iron metal. While Eddie is away selling, the brother Louie turns up as a mini gangster on the lam, arriving at the mother’s house seeking temporary asylum from the mob. Grandma initially refuses to accept the two young boys, Arty and Nicholas, but finally permits them to stay with her, as Bella has been so positive with the idea of having some company in the house. Bella already has difficulty finding her place – in life itself, as well as in her mother’s home, but is enthusiastic about accepting the presence of her two young nephews. Elijah Walker Brandt and Nicholas Dunnigan are super as the young boys. Brandt has a sly look of someone who has figured out how to get by in life by his smarts and basically-pleasant demeanor. Jay is older and wants “out” of the entire family situation, hoping the wily uncle Louie will take him away from the home. 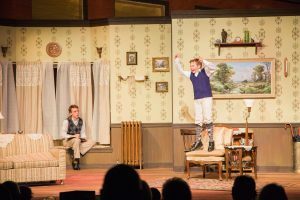 Dunnigan is convincing as the boy on the cusp of manhood, and is marvelous in a confrontational scene with the lawbreaking uncle. Added to the mix is Gert, Bella’s sister who does not live with Grandma. Gert is played by Charity Ruth Haskins, and is a vocal riot. She has her own emotional problems, which show up when she becomes anxious and loses verbal control. Billie McBride has directed the production with great care, making certain that the audience is actually sympathetic to the crazed family. Scenic design is by Joel Adam Chavez, with set constructed by Justin Hermanek. 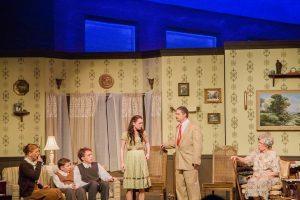 The set is a wonder on its own, with careful details of a lifetime of Grandma’s mementos. Family dynamics are a wonder to observe — from a distance. Grandma has been miserable virtually all of her life, basically showing meanness to her children. She cannot understand, however, why they have no desire to be around her, but turn up on her doorstep when they have nowhere else to turn. 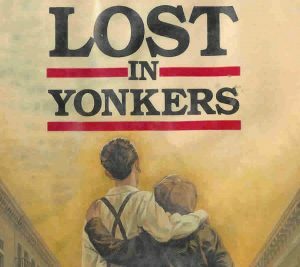 The cast of “Lost in Yonkers” is a great display of ensemble acting. Some of the characters are not likeable. Some make us nervous. All are in great need of some sort of acceptance, love, and support. They all turn up in the same house to hopefully be rescued from each other and themselves. The entire production is an insightful look at the dynamics of the “family.” Curiously, it is the most-dysfunctional Bella who brings some cohesion to the group. Actress Morgan Howard is up to the task with a performance of enormous humanity. “Lost” is a super production, yet another highlight in Midtown Arts Center’s banner year of excellent shows.